There has always been some gap between rich and poor in this country, but in the last few decades what it means to be rich has changed dramatically. Alarmingly, the greatest income gap is not between the 1 percent and the 99 percent, but within the wealthiest 1 percent of our nation—as the merely wealthy are left behind by the rapidly expanding fortunes of the new global super-rich. Forget the 1 percent; Plutocrats proves that it is the wealthiest 0.1 percent who are outpacing the rest of us at break-neck speed. What's changed is more than numbers. Today, most colossal fortunes are new, not inherited—amassed by perceptive businessmen who see themselves as deserving victors in a cut-throat international competition. As a transglobal class of successful professionals, today's self-made oligarchs often feel they have more in common with one another than with their countrymen back home. Bringing together the economics and psychology of these new super-rich, Plutocrats puts us inside a league very much of its own, with its own rules. The closest mirror to our own time is the late nineteenth century Gilded Age—the era of powerful 'robber barons' like Andrew Carnegie and John D. Rockefeller. Then as now, emerging markets and innovative technologies collided to produce unprecedented wealth for more people than ever in human history. Yet those at the very top benefited far more than others—and from this pinnacle they exercised immense and unchecked power in their countries. Today's closest analogue to these robber barons can be found in the turbulent economies of India, Brazil, and China, all home to ferocious market competition and political turmoil. But wealth, corruption, and populism are no longer constrained by national borders, so this new Gilded Age is already transforming the economics of the West as well. Plutocrats demonstrates how social upheavals generated by the first Gilded Age may pale in comparison to what is in store for us, as the wealth of the entire globalized world is concentrated in fewer and fewer hands. Cracking open the tight-knit world of the new global super-rich is Chrystia Freeland, an acclaimed business journalist who has spent nearly two decades reporting on the new transglobal elite. She parses an internal Citigroup memo that urges clients to design portfolios around the international "Plutonomy" and not the national "rest"; follows Russian, Mexican, and Indian oligarchs during the privatization boom as they manipulate the levers of power to commandeer their local economies; breaks down the gender divide between the vast female-managed 'middle class' and the world's one thousand billionaires; shows how, by controlling both the economic and political institutions of their nation, the richest members of China's National People's Congress have amassed more wealth than every branch of American government combined—the president, his cabinet, the justices of the Supreme Court, and both houses of Congress. Though the results can be shocking, Freeland dissects the lives of the world's wealthiest individuals with empathy, intelligence, and deep insight. 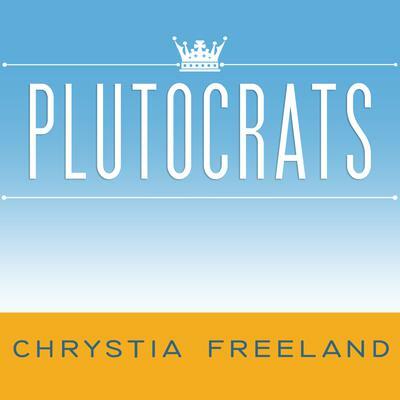 Intelligently written, powerfully researched, and propelled by fascinating original interviews with the plutocrats themselves, Plutocrats is a tour-de-force of social and economic history, and the definitive examination of inequality in our time.